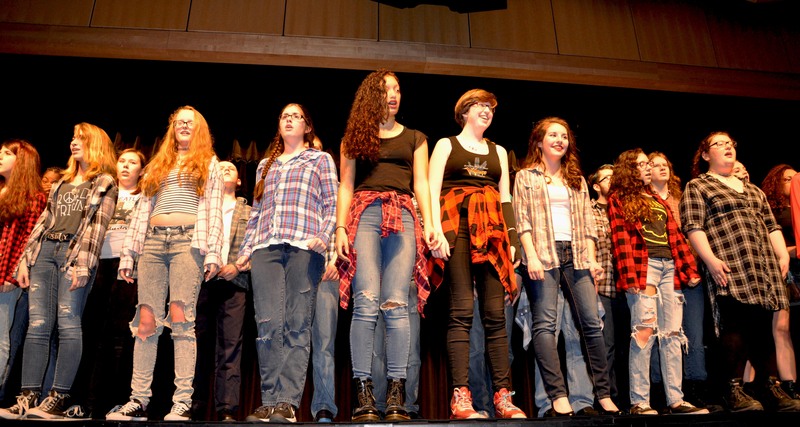 The Rockland High School Music Department held their annual Broadway Night on Friday, April 1, 2016 in the high school auditorium. The band and chorus performed excerpts from two Broadway shows: Into the Woods and Rent. High energy and talented singers provided a special musical event featuring cabaret style entertainment by the full chorus along with selected solos and duets. The chorus sings “Seasons of Love” from Rent. Left to right: Jailene Escalera, Erika Wiley, Sophie McLellan and Paige Boggs. Jurnee Dunn sings “Out Tonight” from Rent. Lauren Illes sings “I Know Things Now” from Into the Woods. The band, including director John Piazza takes its bows.